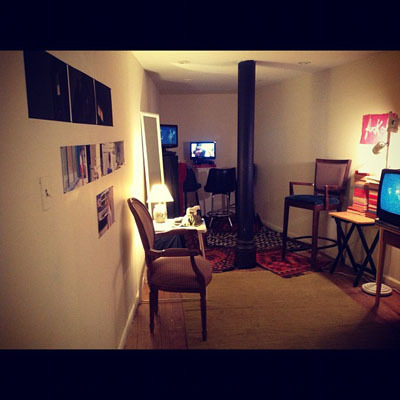 InterArts Media MFA Valentina Vella will be guiding viewers in an artist’s tour of her recent installation at the Co-Propserity Sphere in Bridgeport later today. Thursday, November 29 is the last day of the exhibition Triangulation, a not-so-literal take on the geometric concept, in which ten current members of the Co-Prosperity School located themselves by “measuring the angles” between themselves and two other people. Vella’s collaboration with two other female artists, Hui-min Tsen and Karin Zuppiger, explored the idea of The Other, be it an idealized romantic other, the unknown artistic collaborator, the Double as a projection of the Self, or perhaps even the Alter Ego. Says Vella, “Hui-min Tsen doesn’t know Karin, and she also hardly knows me, enabling us to stretch the boundaries of our imaginations in creating our response works.” Part of Vella’s installation includes a video that is a segment of her current project, involving riding a horse to California.